Georgian President Mikhail Saakashvili’s wife and two children are reported to have taken refuge in the Ukraine at the holiday home of its President, Viktor Yushchenko. Russian newspaper DNI.ru reports that Saakashvili’s wife, Sandra Roelofs, was visiting the Olympics in Beijing with her children when Georgia attacked South Ossetia. But instead of returning to Tbilisi, they decided to stay at Yushchenko’s closely guarded dacha on the Crimean Peninsula. 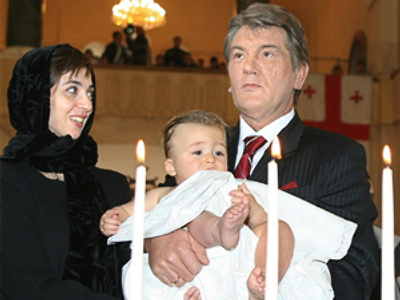 The two presidents’ families have a close relationship – Yushchenko is a godfather of Saakashvili’s younger son, while Saakashvili christened one of Yushchenko’s daughters. It was earlier reported that Roelofs was set to return to the U.S. and seek help from her psychotherapist. She was said to be stressed by the news of Georgia’s offensive in its breakaway republic of South Ossetia. As a result of the attack by the Georgian army, the ancient town of Tskhinvali was almost wiped out and over two thousand people were killed.